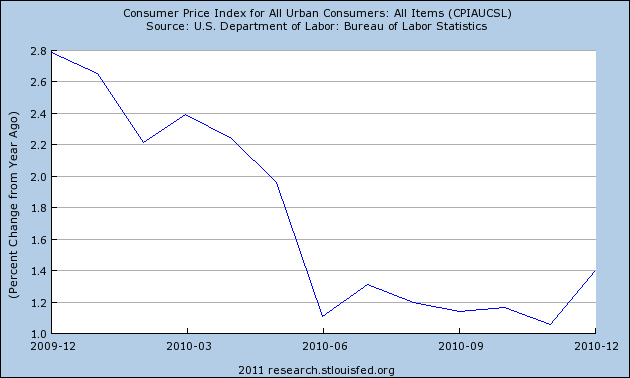 are you denying that there was disinflation in 2010 in the USA? If so, you need to review your definitions. Yes. 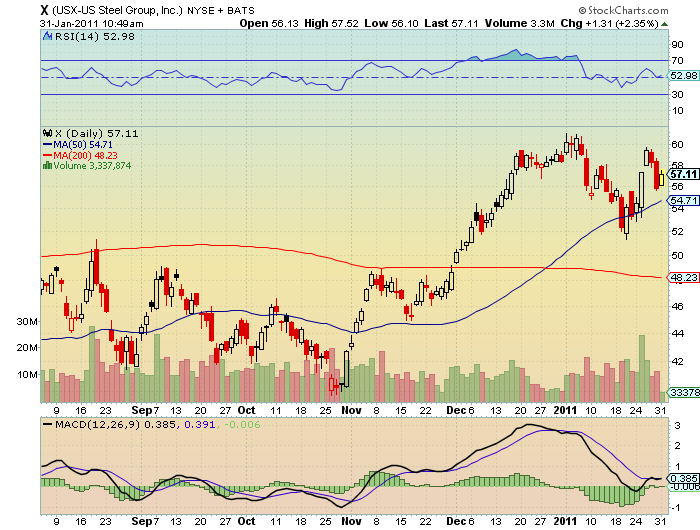 Simply look at TPC’s chart. That shows a positive inflation all year. The chart that he uses shows % changes in inflation. However, ignoring the chart, money + credit expanded all year: that my friend, is inflation. Also, what is so bad about a little inflation? Obviously, as an economy grows and expands there will be upward pressure on prices due to increasing competition, sticky wages, and a broader money supply in line with a growing population. Based on your analysis it sounds like you are saying the USA is worse off than it was 100 years ago. Obviously, that’s wrong. Inflation is government theft of your production. Theft of your production, is never good. From a wealth perspective, yes, the US was far wealthier 100yrs ago. How do you think that you are paying for your excesses of the last few decades? So, it’s you who looks pretty stupid right now. 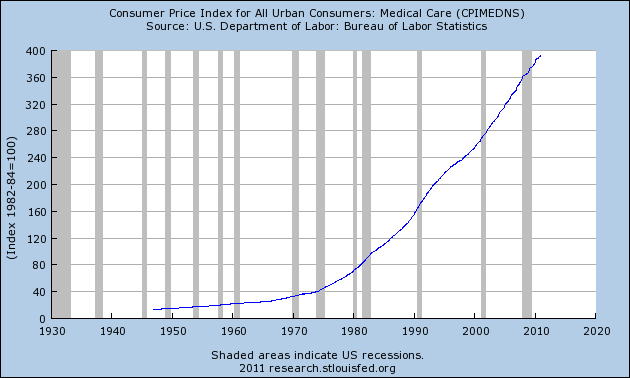 You’ve been telling us about the high inflation in the USA for several years now. You were wrong. Simply look at the data in the original post. Then come back and explain why the inflation has risen for the last 100yrs. I also noticed that you ignored his comments showing dispoable real incomes always outpace inflation. That chart alone pretty much ruins your whole argument. Funnily enough, I’ve just posted on this topic. After Tax, or net, this is not the case. It is only after Tax returns [wages] that matter. Also, what’s your outlook specifically? Thanks. I see Bernanke and Geithner continuing on this same road: they are intellectually bankrupt, fools, charlatans, thieves: thus, continued, and accelerating inflation, with no pick-up in employment, which is the 1970’s stagflation all over again. I don’t think that they are going to be great. Just not as bad as expected. 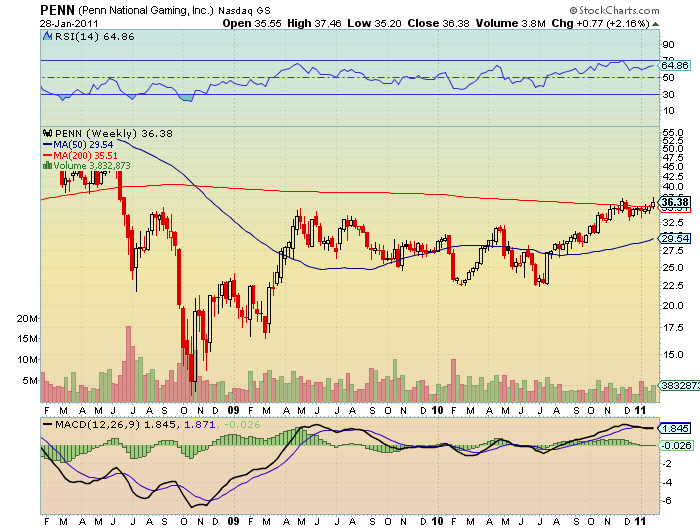 Thus, we might get a bit of a pop in the stock. 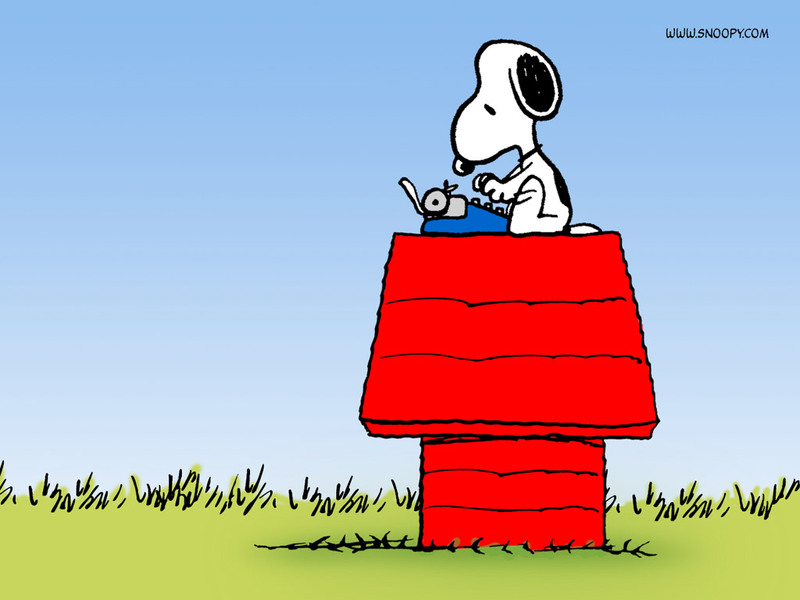 TPC: stupid, or just disingeneous? 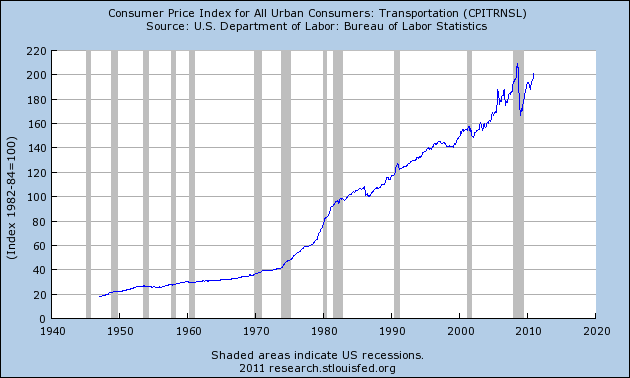 TPC has a new post up on inflation here but it is so full of poor analysis I’m starting to wonder. A little over a year ago I said inflation concerns in the USA were blown out of proportion and that we were likely to see an environment of disinflation “with a greater risk of deflation than hyperinflation”. One year later that’s clearly what has occurred in the USA as disinflation ensued. Overall inflation has continued to decline and deflationary fears became so substantial in Q3 2010 that the Fed panicked into implementing QE2. Where in reality, if we take the same period approximately, mid 2009 when the CPI was at 210, it is now at 220 in little over a year, which is approximately an inflation rate of 4.76%. That is not even taking into account that the CPI weights OER’s at 25% of the index, and they have been falling along with the housing market. Rather, let’s look at some specifics: food, you know something it’s rather difficult to replace. How about medical care? You know, should you be hit by a bus. One thing we know from the credit crisis is that the Fed’s various “money printing” operations have had a far lesser impact on the rate of inflation than most presumed they would. Despite an explosion in the monetary base inflation is near its lows. Twaddle. Utter rubbish. Only if you are looking at the data that you provided in this post. 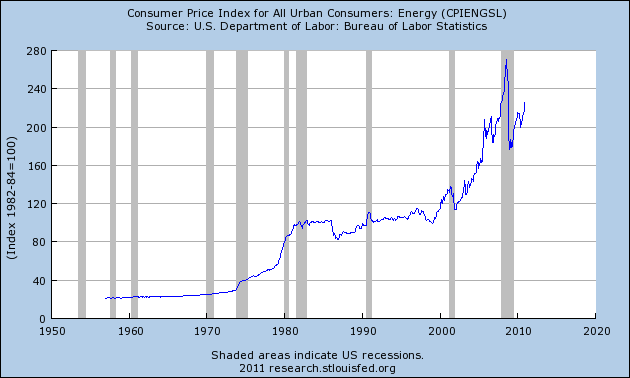 Inflation, far from being near it’s lows, is near, or exceeding it’s all time highs. From a demand-pull perspective the story remains little changed from last year. This environment of low capacity utilization and tepid aggregate demand is likely to result in benign inflation. This is due to the continuing strains at the consumer level. Demand-pull inflation: no such beast. There is money and credit expansion: that’s it. Although commodities have become the hot button topic in recent months, the truth is that labor is still the most significant input in the cost-push inflation equation. And that input remains weak. Cost-push inflation: no such beast. See above. This all adds up to an environment in which we’re likely to continue seeing below average levels (3.5%) of inflation in the USA. Although I do expect inflation to approach ~2.5%+ by the end of 2011 we remain in an environment where downside risks remain more prevalent than the risk of high levels of inflation. An underlying environment of deflation is likely to continue being masked by government intervention and a global recovery that results in higher commodity prices. I don’t dispute that deflation is possible: even likely, if, government had allowed the liquidation of worthless assets, and the deleveraging and bankruptcies of the banking system. It was governments direct culpability that the excesses were built into the financial system, and they are trying to do it again, through blowing another bubble. The risk of hyperinflation remains extraordinarily low based on this outlook and we’re likely to continue experiencing below average levels of inflation although the tepid recovery in the USA and abroad should contribute positively to inflation in the coming year. Low, but not impossible: and that is a very real risk that is daily growing as the government continues it’s reckless expansion of the money supply. 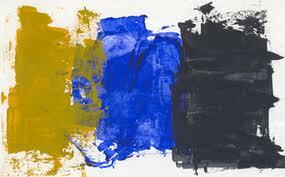 Just so that it is clear that these are actually two separate paintings. I like this for a LONG position. May well initiate the position on Monday. That looks impressive,but frankly it’s meaningless crap. 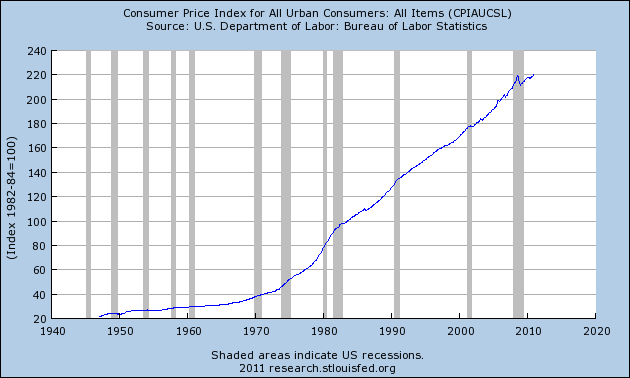 For example I suppose you might say since 1970 the 600% ish rise in inflation has impacted purchasing power. However, you’re only looking at one aspectof purchasing power. Income over that period has gone from …well I started on something less than £5 pw back then..so £300pa perhaps to this time when even minimum wage is £7 to £8 phr conservatively £14000 pa ..so much for inflation being ‘bad’ …actually people have never had it so good and theirin lies the problem ..overshoot from silly govt and central bank policies and now no one’s going to enjoy the adjustment because when you give people something ..in this case the prospect of higher expectations it get’s really messy trying to take it away. The above’s the crux of the issue and actually you’re nearly old enough to remember how lifestyles have moved across that period although I suspect it’s more meaningful for you dating from the 1980′s. None of it matters anyway. One thing remains true regardless. The competent float to the top in any conditions so the only question really becomes are you one of the competent or the incompetent ? Let me first present some data, then I will refute the above statement. The data calculates out to a growth of 4.9%. The important point here, is that this is gross, pre-tax. Inflation is always after tax, or net. The interesting point to bear in mind here is that an increase in your nominal gross wage, pushes you into a higher tax bracket: thus as your nominal wage grows, your net, can actually fall in real terms. Add, or rather, subtract State taxes, indirect taxes, such as VAT [although the US doesn’t have VAT] Thus, your net income falls even lower. 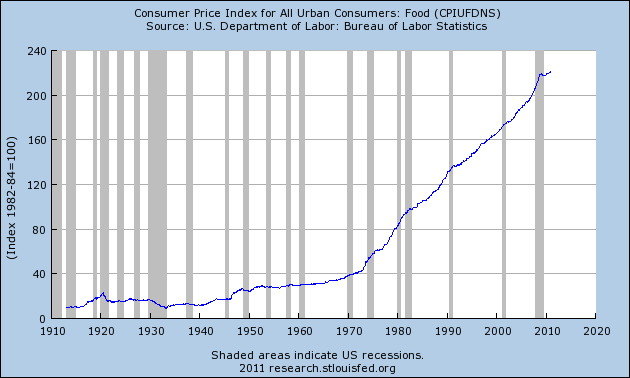 At this point, we look at the historical inflation rate, which for the period between 1970-2010 has been 4.5%. The after tax growth in wages is approximately [in the lowest band] 4.06%. Thus inflation has exceeded the growth in wages significantly. Then we can talk about the political manipulations under various governments of the CPI and hence the true inflation rate. I therefore refute you statement with regards to real purchasing power: it has declined significantly. Capitalism has managed to offset the most egregious depredations of government, but the consistent creep to socialism is, and has destroyed so much wealth, that was generated prior to the time period that we are talking about, that now its ability to do so is fatally eroded, and we shall see the effects in drastically lower living standards as we speak. I agree that the talented will overcome and prosper, but, unless those below are also moving forward, this situation will be at risk. 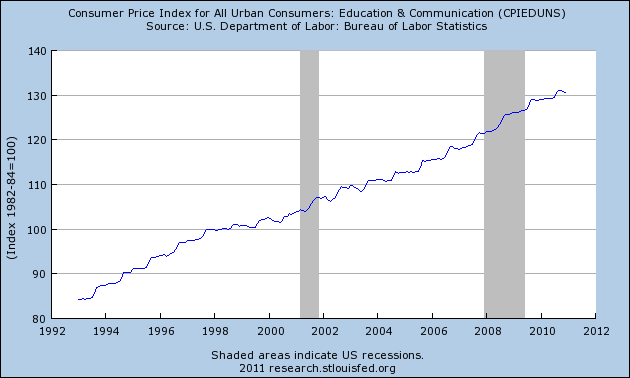 This is the aggregate CPI which includes OER, that weights at 25% of the index. Even with OER holding down the numbers, inflation is currently running at 3% per annum. Stagflation has arrived. Courtesy of the government.